Star Dog was started as a way for us to collect clothing for Tashirat Orphanage in Moreles, Mexico. Our dear friends run this orphanage, which provides abandoned neglected and abused children with a healthy home life and future. We really admire the one for one model of business as it creates a sustainable vehicle for our giving. This allows us to not have to rely on donations. 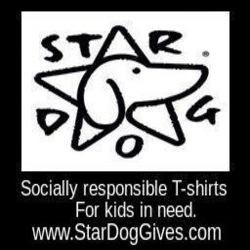 For every t-shirt a person buys Star Dog gives one to a child at the orphanage. After such a positive response and seeing the outpouring of support for the kids at Tahisrat, we realize that we cannot just stop there. There are so many kids we can help beyond Tashirat. Which is why I feel that a Product Marketing Breakthough membership for a lifetime would be beneficial to Star Dog. For those who don’t know, PMB provides personal mentoring and coaching from t-shirt entrepreneur Andreea Ayers. In PMB she teaches proven strategies to get products into the media, gain publicity and boost sales. Andreea started a t-shirt company without a stitch of fashion experience and was able to take her company from 96 shirts to 20,000 within a few short years. If Star Dog could follow Andreea’s business plan and sell 20, 000 shirts, that is 20,000 needy kids we help in return. I have already learned so much from Andreea’s free coaching materials and I am excited to keep learning. I realize the importance of learning from people who have been through the same business experience and prospered. Andreea’s t-shirt background is a bonus for Star Dog. I believe we can benefit greatly from a likewise business. In three years with the help of PMB, I would hope to promote awareness, increase visibility and turn Star Dog into a household name. I would love to be able to build relationships with graphic designers, magazine and newspaper editors, and my customers. Ultimately, my dream is for Star Dog “Giving Trips,” trips where we visit children who need us most. I would love to, on a frequent basis, to be able to see the looks on the faces of those we help, and experience the joy when they put on a brand new shirt. With the PMB Opportunity this can all be possible. IMPORTANT to my STAR DOG FANS: Please log onto www.Facebook.com/LaunchGrowJoy find the “recent post from others” section and scroll thru to find the Star Dog entry and like it. The more likes I receive increase our chances of winning this spectacular opportunity. MANY THANKS! Last week Debra Winters, from our local newspaper Wayne Today, published an article about STAR DOG! The article has helped us spread the word about our cause and what we’re trying to accomplish. I’m so thankful to Debra for taking the time to interview me and spread our story. Chilling on a Lazy Sunday in our Star Dog Tees! The Mission of the Tashirat Orphanage is to take in disabled children, children who are too old to be adopted, or siblings who normally are separated from each other or left in overcrowded government orphanages for the rest of their childhood. Upon turning 18, these children would have been sent into the world alone with no one to count on, no social preparation, adequate education or security. Our disabled kids would have been institutionalized for life since they had no family to care for them. Our orphanage is a loving home that gives the most marginalized children what they always dreamed of, but never thought possible. Tashirat is comprised of small families. Most staff members are foster parents to 3 – 8 children and each family has their living quarters. The children are cared for and loved as our own. Although they will eventually attend universities and go out into the world to start their adult lives, they will always have a home and family to fall back on. All of the children arrived in an extremely poor state of health. Many were on heavy medications for chronic illnesses; all were malnourished and weak physically as well as emotionally. Ten of our children are special needs children with various disabilities, psychological and mental disorders. All of the others have overcome deep emotional traumas. We have watched all the children flourish since their arrival and with every passing year they realize more of their potential, becoming less “special needs” and more confident and secure. Living in a positive environment where they are cherished and their loves and talents are cultivated has given all of our Tashirat children the force to transform into the most open, communicative, harmonious, fun and beautiful individuals. The Tashirat children are given the highest quality vegetarian diet. We use homeopathy when necessary and avoid using allopathic medications. In Tashirat we live ecologically. The children are raised to become independently thinking, globally and spiritually conscious individuals who care about themselves, others and the world as a whole. All children understand English and most are fully bilingual now. Our permanent staff team is entirely dedicated to the children as well as their own spiritual paths. The Tashirat staff members are from all over the world and speak both English and Spanish. A majority of the staff members have lived and worked in Tashirat for over decade. Our First STAR DOG shipment arrived today!! We want to keep you up to date with news, events, discounts and new t-shirts designs. Star Dog now has a mailing list. Join our mailing list and you will be entered to win a free Star Dog t-shirt. To be eligible to win, you need to subscribe to our mailing list and be a current subscriber as of April 30, 2013. On May 1, 2013 at 12 noon est we will choose a random winner from all mailing list subscribers. Not only will you receive a free t-shirt but we will donate an identical shirt to a child in need. If you change your mind, you can unsubscribe any time. We’ll never share your email address with anyone, period.